Countless legends surround Mt. Cristobal. With its summit taking on a characteristic ‘W’ shape, like that of stealth bomber, it is flanked by the grander Mt. Banahaw to its northeast, and together, they figure prominently in folklore. For instance, it is said that while Mt. Banahaw is a holy mountain, Mt. Cristobal is the “Devil’s mountain”, and the two mountains possess good and evil energies that cancel out. The primeval forests of Cristobal, decked with ferns and thorny plants, culminating in its ancient crater, seem to fit the bill of an eerie mountain. Furthermore, there are tales of voices or apparitions, such as the creature called ‘Tumao’, waylaying mountain climbers; many hiking groups have their own “ghost stories” to tell. Even locals believe these stories; some guides say they have amulets to counteract the negative energy. These legends notwithstanding, there is no reason to be afraid of Mt. Cristobal. Its forests are pristine, with a splendid array of flora that include giant pakpaklawin, varicolored flowering plants, rattan, etc. Two types of civet cats, the musang and the animus, roam freely in the forests. There are also reptile species, including those locally known as the bubuli and the balikakas. The Dolores trail is by far the most common trail used to climb Mt. Cristobal. This trail commences just before you enter Brgy. Kinabuhayan (the jump-off to Mt. Banahaw). To your left, there is trail; you could see the range-like Mt. Cristobal looming to the west. A thirty-minute walk, through on-and-off cemented paths, would take you to house of the psychic, Montelibano. There are citrus fruits (dalanghita) along the way. From the Montelibano house, the forest ensues, taking 2-3 hours to cross. Take note of the ferns that demarcate the trail all throughout. Occasionally, there would be views of Tayabas Bay, with Mt. Daguldul to the west and, on a very clear day, Marinduque to the south. Due to the dense forest, however, panoramic views are rare. 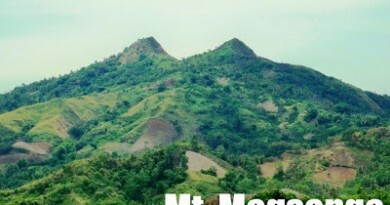 Further up the jungle, the western portion of the crater rim would have a striking resemblance with the Rockies of Mt. Maculot. The trail is pretty straightforward; there’s only one confusing fork, marked by a big rock. Go straight to the right trail. At 1130 MASL, you will cross the cogon line. At 1380 MASL, a small campsite will be found. From here the path leads to the crater, taking around 20 minutes. At the crater, the land is flat; oftentimes it has a misty appearance. A “Cristobal Lake” may be formed in the crater after heavy rains, creating a swamp-like appearance. There are at campsites here; able to accommodate several tents. A traverse of Mt. 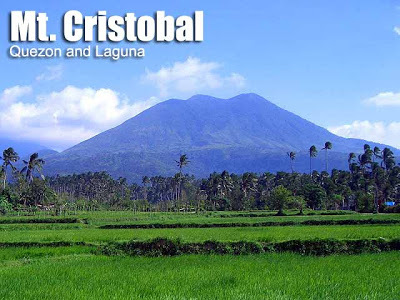 Cristobal entails crossing over to the Nagcarlan side, north of the crater. You will reach a high point at the crater rim, and from there, it will be a descent through similar forested environs. The entire trail takes 3-4 hours to negotiate. It would be best to get a guide though, as the trail here is not that established. Mt. Cristobal may also be accessed by Brgy. San Cristobal in San Pablo, forming the third and longest route to Cristobal. Be warned that the hunter trails here are quite confusing. 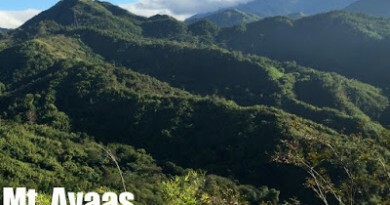 The first parts would be grasslands or woodlands with sampinit (wild berries) growing; a dense forest follows – perhaps the densest in the whole mountain. There is an area called “Koronang Tinik” in which the whole place is surrounded by thorny trees, palms, and vines; branches of thorns stick out of the trail, and can only be removed by moving one step backward. Katmon trees, bearing edible fruits, also grow here. Ultimately, you will reach the crater rim at 1400 MASL. Between the San. 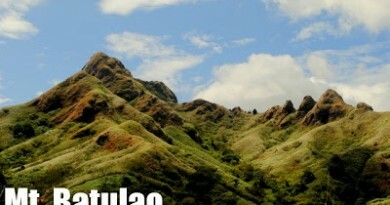 Cristobal (west) and Dolores (southeast) sides of the mountain is a wide cogon grassland; for many reasons, avoid this area when you are trailblazing/exploring Mt. Cristobal. The transportation to San Pablo City is serviced by Lucena-bound buses e.g. Green Star, JAM, Lucena Lines. There are stations in Buendia and Cubao. From San Pablo City, best options are private vehicles or a rented jeep, since public transport is irregular. There is no registration to Cristobal. In the main street of Brgy. Kinabuhayan, the same Banahaw guides can guide you to Mt. Cristobal, at P200~P300 per day. A contact number is +639152409138. Cellphone signal is sporadic throughout the Cristobal trail in the Dolores and Nagcarlan sides; it is more stable in the San Pablo side. Take note that the crater can become a swamp in the rainy season; if so, two nearby small campsites can accommodate tents. Strong winds plus high elevation equals a cold and windy night when camping, so prepare accordingly. Useful numbers include those of the Quezon Provincial Police Office, +63427102351, +63427103101. A nearby hospital is San Pablo City Doctors’ Hospital, +63495627992. During coffee season, around January, the civet cats feed on coffee beans and excrete them undigested. These excreted beans litter the trails and are a sought-after delicacy, fetching thousands per kilo in Europe. The explanation is, because of the cats’ acute sense of smell, they are able to select the best beans. The Cristobal trails are one of the cleanest mountain trails. When asked why, our local guide said: “Because only mountaineers climb here.” His words are a shining testimony of hikers’ reputation; hopefully we will be able to live up to this name in the future, in Cristobal and elsewhere. On a humorous endnote: The author first climbed Mt. Cristobal via Brgy. San Cristobal. What was supposed to be a daytrip become an overnight adventure. We spent the night in the inclined cogon slopes, 1275 MASL. When our companion woke up, his sandals were gone! The malignant spirits of Cristobal at play? Lacking provisions, he had to descent through the dense forests and woodlands – all the way to his home in San Pablo – barefoot! © PinoyMountaineer 2007. All rights reserved. 317 Comments on "Mt. Cristobal (1,470+) [CLOSED]"
Open na po ba ang Cristobal? Thanks in advance and more power! bukas na po b Mt. Cristobal mga sir? sino po akyat sa inyo sa october 31 2014.